Capt. 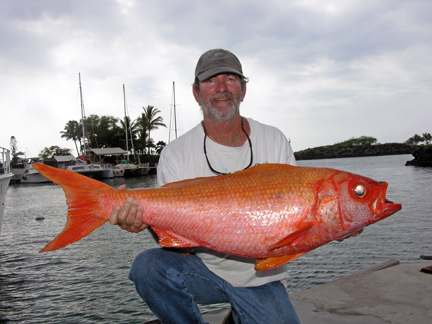 Dale Leverone was fishing in 1050 feet of water outside of Kona, Hawaii on August 25, 2009 when he caught this rare snapper. The fish ate a squid bait rigged on a Penn 130 International reel loaded with 200-lb test line. This is the second time that Capt. Dale has broken this state record. The Randall snapper is named after Dr. Jack Randall of the Bishop Museum who is the official ichthyologist for HFN's state records. While Dr. Jack knew the Latin name of the fish, Randallichitys filamentosus, he was surprised to find that the fish's common name was also linked to his.